Check out the Inca played by the developers. Discuss the livestream here. 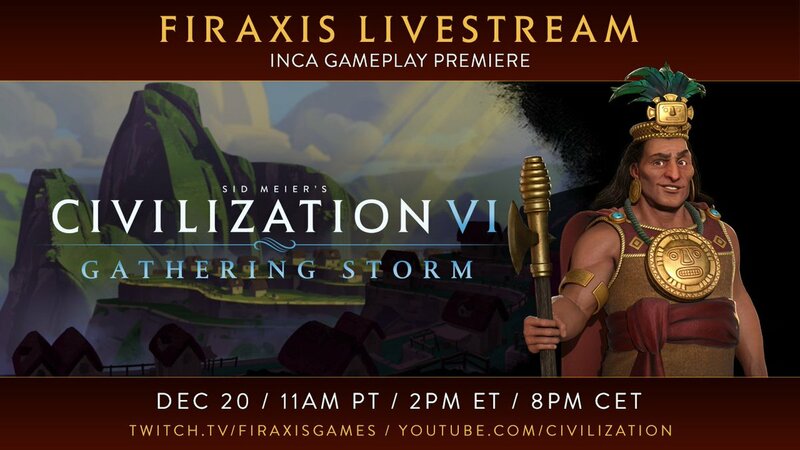 The Inca come to Civilization VI in the Gathering Storm Expansion. Join the discussion here. The best medicine. Regular players Daniel “DanQ” Quick, ”Makahlua”, Steve “WarningU2” Warner and Matthieu “GrimVek” are joined alongside fellow co-operative Civilization VI multiplaying gamers in the one-hundred-and-second episode of TurnCast (TC). Entitled “Need to Laugh“, it carries a runtime of 09m59s. Snippets include but are not limited to family time, episode lengh, giggle box, still alive and stop that. Faring thee well. The three hundred-and-twenty-seventh episode of PolyCast, “End of an Era“, features regular co-hosts Daniel “DanQ” Quick, Stephanie “Makahlua”, Philip “TheMeInTeam” and Jason “MegaBearsFan” Grade in what is Quick’s last episode recording as the show’s lead panelist. Carrying a runtime of 2h18m06s, it is the show’s longest episode to date. The first two recurring guest co-hosts come on to discuss their first impressions of Civilization VI expansion pack Gathering Storm‘s announcement and saying farewell to the show’s co-founder and lead panelist. The next pair of recurring guests give their take on Gathering Storm and the show’s imminent, so-called “Transition 2019”. The third pair of recurring guests chime in on Gathering Storm and the show’s changing of the guard on the horizon. The first trio share their Civilization VI: Gathering Storm and “Transition” thoughts. A one-time panelist on a show special ten years ago returns to discuss their ongoing Civilization: Beyond Earth play and their takeaway with respect to “Transition 2019”. The fourth recurring guest co-host pair arrive to explore Civilization VI: Gathering Storm and weigh in on “Transition 2019”. The fifth pair of recurring guest co-hosts add to the discussion that is Gathering Storm and the imminent changes ahead for the show. Reflecting on Civilization VI: Gathering Storm and the show’s “Transition” is undertaken by a recurring guest. The second trio chime in on the news that is Gathering Storm and the show’s departing co-founder and lead panelist. On the last episode recording with all current regular panelists, the four share their thoughts on “Transition 2019” alongside incoming lead panelist “CanusAlbinus”. Segments inclusion preference? Favourite regular co-host? These are two of the five questions being asked of the 2018 PolyCast (PC) audience as its twelfth season nears its conclusion. PolyCast is a bi-weekly audio production recording live every other Saturday throughout the year, in an ongoing effort to give the Civ community an interactive voice. The developers for Civilization VI: Gathering Storm play Canada in this livestream.